15 years ago Buddy the Elf hopped aboard a floating piece of ice and left the North Pole to hunt down his estranged father and learn about the real world. Will Ferrell’s endearing innocence contrasted against the corporate greed he finds his father wrapped up in made the movie a success. 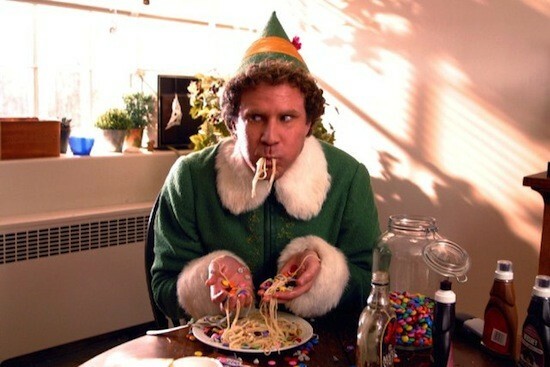 The usual helping of Ferrell one liners weren’t the only takeaway from the film, however, most folks who’ve seen it remember the positively disgusting concoctions of food that Buddy brought to the dinner table. Chicagoans this holiday season will be able to live that diabetes inducing experience, as Miss Ricky’s restaurant inside of the of Virgin Hotel is serving syrup & candy topped spaghetti. According to this article about the promotion from thetakeout.com, the restaurant will also be playing the movie a constant loop this while serving this Christmas. Thoughts and prayers to the employees of that restaurant. The whole dish will cost you $15, and probably some extra money for stomach related medicine on the drive home. Byeeee Buddyyyyy! The history of music and its impact on culture in the Windy City is well documented. A rich musical history compliments a still flourishing scene deep in the heart of Chicago. Paste Magazine, a digital magazine covering music and popular culture released a list of 15 bands this week that are based in Chicago worth knowing about. (Sidebar: I came to find this list through the Chicago Subreddit on Reddit.com, a great place for locals to discover new things and topics in the city.) Paste points out the names that folks commonly associate with Chicago Musicians: Muddy Waters, Sam Cooke, Earth, Wind & Fire, The Smashing Pumpkins, Liz Phair, Wilco, The Jesus Lizard, Veruca Salt and Fall Out Boy. More recently, Chicago has boasted artists like Chance The Rapper, Whitney, Vic Mensa, Twin Peaks, Rise Against and Smith Westerns. This doesn’t even begin to scratch the surface of the jazz and blues scene which helped shape the genres across the entire nation, let alone Chicago. This list is more of an education of the existing scene, i’m not much a thought leader on the edgier types of music that exist (big Waylon Jennings guy over here), but if you’re into discovering new music, Paste has assembled a truly terrific group artists to sink your teeth into. The Chicago Bears are in the midst of a dream season. It’s not 1985 by any stretch of the imagination but Sunday’s have been enjoyable for Bears fans for the first time in a long time. Mitch Trubisky seems to be figuring it out, Khalil Mack is an absolute monster, the Bears are in control of the NFC North, things are good, right? Not if you’re Cody Parkey. 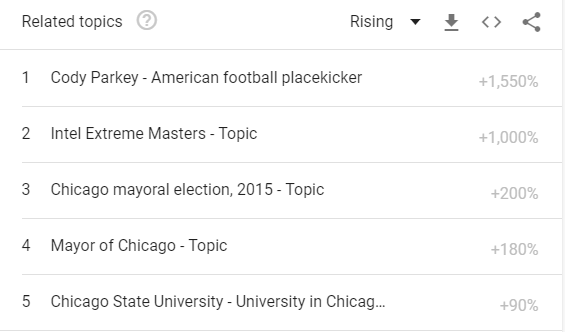 Google Trends shows a pretty clear spike in traffic for Parkey (or just Bears Kicker) during the week 10 matchup against Detroit, their division rival, this Sunday. Parkey defied all imaginable odds and kicked 4 balls off the uprights and missed all of them. We can discuss the impact of his poor performance until the cows come home, but it’s worth mentioning that you most likely will never see that again in your lifetime. Twitter was…aware of the situation, in a way that only Twitter can be. The Bears organization isn’t giving up on Parkey just yet, however. Bears coach Matt Nagy said after the game that he wasn’t going to try out any new kickers this week. “There’s zero chance of that,” he said according to this article from the Sun-Times. Parkey’s teammates have been supportive, and hopefully the fans will eventually get over it as well. 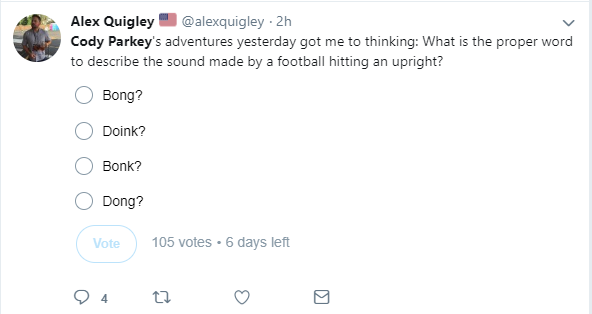 In the meantime, if someone wanted to work out the statistical probability of hitting the upright four times in a game I’d love to read it. Popular sports podcaster and internet culture phenom “Barstool Big Cat,” also known as Dan Katz is coming to Chicago for a two show event at The Laugh Factory. Known for his podcast and video antics on Barstool.com, Katz is a one man brand that keeps on growing. On top of that he’s also a known supporter of all things Chicago. It remains unclear what his performance in the show will actually encompass, but you can be sure it will be both crude and hilarious. Tickets are available at the Laugh Factory website here. Twitter took notice, and for those who aren’t familiar with Katz and his routine, you can expect lots of inside jokes he shares with his podcast and digital audience. Due to his unique brand of physical comedy and genuinely clever banter, you will probably enjoy yourself anyway. Go support one of Chicago’s own, whether you’re a Stoolie or not.